Ossip Samoilovich Bernstein (20 September 1882 – 30 November 1962) was a Russian-French chess grandmaster and a financial lawyer. Born in Zhytomyr, Russian Empire to a family of Jewish heritage, Ossip Bernstein grew up in the Russian Empire. He earned a doctorate in law at Heidelberg University in 1906, and became a financial lawyer. In 1918, after the October Revolution, Bernstein was arrested in Odessa by the Cheka (Bolshevik secret police). He was ordered to be shot by a firing squad because he was a legal adviser to bankers. As the firing squad lined up, a superior officer asked to see the list of prisoners' names. Discovering the name of Ossip Bernstein, he was asked whether he was the famous chess master. Not satisfied with Bernstein's affirmative reply, the officer made Bernstein play a game with him. If Bernstein lost or drew, he would be shot. Bernstein won in short order and was released. He escaped on a British ship and settled in Paris. Bernstein was a successful businessman who earned considerable wealth before losing it in the Bolshevik Revolution. He earned a second fortune that was lost in the Great Depression, and a third that was lost when France was invaded by the Third Reich in 1940. His Jewish origins meant that he could not remain in occupied France, and he was forced to flee to Spain and settled in Barcelona. Bernstein died in a sanatorium in the French Pyrenees in 1962. In June 1902, Bernstein won at Berlin. In July–August 1902, he took 2nd, behind Walter John, at Hannover (the 13th DSB Congress, Hauptturnier A). In 1902/03, he won at Berlin. In September 1903, he took 2nd, behind Mikhail Chigorin, in the Kiev 1903 chess tournament (the 3rd All-Russian Masters' Tournament). In 1903/04, he tied for 2nd–3rd with Rudolf Spielmann, behind Horatio Caro, at Berlin. In July–August 1904, he tied for 4th–5th at Coburg (14th DSB Congress). In August 1905, he tied for 4th–5th at Barmen (Masters A). In 1906, he tied for 1st with Carl Schlechter at Stockholm. In 1906, he tied for 4th–6th at Ostend. In 1907, he tied for 1st with Akiba Rubinstein at Ostend (Masters A). In 1909, he took 5th at Sankt Petersburg. In 1911, he won the Moscow City Championship. In February–March 1911, he tied for 8th–9th in the San Sebastian chess tournament. His loss to Jose Raoul Capablanca in this tournament is remembered because Bernstein had complained that the unknown Capablanca had been allowed to participate. Capablanca was awarded the Brilliancy Prize for this game. In 1912, Bernstein took 2nd, behind Rubinstein, at Vilna (All-Russian ch.). In January 1914, he lost an exhibition mini-match against José Raúl Capablanca at Moscow (+0−1=1). In April–May 1914, he tied for 6th–7th with Rubinstein in the St. Petersburg 1914 chess tournament (Preliminaries). In 1922, he lost a mini-match against Alexander Alekhine in Paris (+0−1=1). In 1930, he took 2nd, behind Hans Johner, at Le Pont. In July 1932, he tied for 5th–6th with Efim Bogoljubow in Bern. In 1932, he beat Oskar Naegeli (+3−1=0) in Zurich. In 1933, he drew a training match against reigning World Chess Champion Alexander Alekhine in Paris (+1−1=2). In 1934, he tied for 6th–7th with Aron Nimzowitsch in Zürich (Alekhine won). In 1938, he drew a match with Oldřich Duras in Prague (+1−1=1). During World War II, he played friendly games with Alekhine and others in Paris in Spring 1940. He fled to Spain after the capitulation of France (Battle of France) in summer 1940. When he reached the Pyrenees, he and his family had to walk over mountain roads at night, hiding in caves during the daylight hours to avoid the Police and Border forces. After two exhausting nights, he reached Spain. However, Bernstein had a heart attack and was unconscious. The Spanish frontier guards arrested the family and placed them in separate prisons. Through the intervention of some influential friends in Spain, his family was released and was allowed to stay in Spain. He returned to Paris in 1945. After the WW II, Bernstein came back to chess. In 1946, he took 2nd, behind Herman Steiner, at London. In 1946, he tied for 15th–16th at Groningen. In June 1946, he won a game against Lajos Steiner at a match Australia vs France in Australia. In December 1948, he drew a game against Reuben Fine at a cable match New York vs Paris. In April 1954, he lost two games against David Bronstein at a match France vs The Soviet Union at Paris. In 1954, he tied for 2nd–3rd with Miguel Najdorf, behind René Letelier, at Montevideo at age 72. Nadjorf protested that it was unfair to play such an aged opponent, and then became so confident of victory that he convinced the tournament organizers to double the First Prize money at the expense of reducing the payouts for the lesser prizes, a gamble that backfired in spectacular fashion as the septuagenarian Bernstein routed him in a 37-move Old Indian Defense that won Bernstein the Brilliancy Prize. Bernstein played at first board for France at the 11th Chess Olympiad in Amsterdam 1954 (+5−5=5). He was a member of the French team, at the 12th Olympiad in Moscow 1956, but he did not play because of illness. When FIDE introduced official titles in 1950, Bernstein was awarded the International Grandmaster title. He had level or nearly level lifetime scores against such outstanding players as the second World Champion Emanuel Lasker (+2−2=1), Akiba Rubinstein (+1−1=7), Aron Nimzowitsch (+1−2=4), Mikhail Chigorin (+2−1=0) and Salo Flohr (+0−0=3). However, he had a poor record against third World Champion José Raúl Capablanca (+0−3=1); and against the fourth World Champion Alexander Alekhine (+1−8=5). Bernstein vs. Miguel Najdorf, Montevideo 1954, Old Indian, Main line, A55, 1–0. The best game prize! ^ The Bobby Fischer I Knew and Other Stories, by Arnold Denker. Denker writes that Edward Lasker originally published this story, and that Bernstein told it to Denker in 1946 when they first met in London. ^ "* Free online chess game search engine". Chessgames.com. Retrieved 2014-02-01. ^ "Bernstein / Zabludov vs Alekhine / Budovsky (1940)". Chessgames.com. Retrieved 2014-02-01. 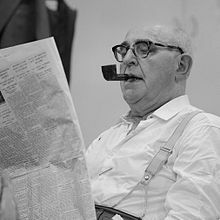 ^ "Ossip Bernstein by Bill Wall". Web.archive.org. Archived from the original on November 7, 2012. Retrieved 2014-02-01. ^ "Bernstein vs. Jacques Mieses, Coburg 1904". Chessgames.com. ^ "Bernstein vs. Emanuel Lasker, St. Petersburg 1914". Chessgames.com. ^ "Bernstein vs. Miguel Najdorf, Montevideo 1954". Chessgames.com. Wikimedia Commons has media related to Ossip Bernstein.